School's out and summer is upon us! Time to layer on the sunscreen and accessories! You know when you hear a story that gives you the chills (and maybe a few tears spring into your eyes?) That’s how it is with April, an ambassador for Noonday Collection (check her out on Facebook here.) We sat over coffee and she shared the most beautiful stories of how Noonday is using fashion to create meaningful opportunities around the world. 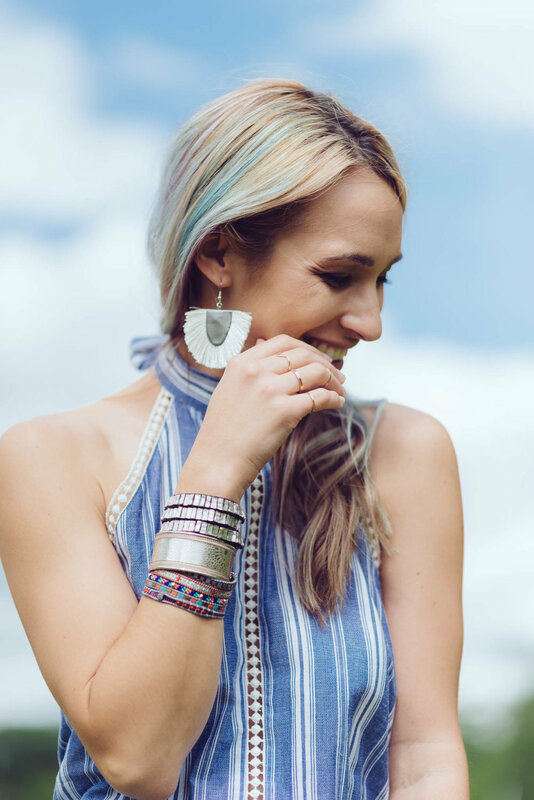 Noonday Collection is a fair trade fashion and design company known for their extraordinary handcrafted pieces and the heartwarming stories behind the artisans who create them. Their jewelry reminds me a lot of the unique and creative styles you find at Anthropologie – one of my all-time favorite places to shop. It has a sense of urbane adventure – and is majorly fashionable without feeling like it’s just following the latest trends. How cool is this ~ Noonday partners with artisan entrepreneurs in vulnerable communities globally. They help artisans develop businesses through fair trade, and empower them to grow sustainably. Noonday is on a mission to create dignified jobs for people who need them, and in turn, they are building a flourishing world where children are cherished, women are empowered, and people can perform meaningful jobs. April reached out to me in hopes of spreading news about their fab jewelry, as well as the genuine honest work opportunities Noonday is creating for those who may otherwise be facing poverty, gender violence, human trafficking and HIV/AIDS. When ambassadors like April showcase Noonday and style their friends, customers can create a growing marketplace for the global artisan businesses. By hosting a Noonday Collection trunk show, you can help change the lives of the artisans right from your own home. Your local ambassador will share stories of the artisans and help pick out a piece or two specific to your style, all while having fun with your friends. When artisans have good jobs where they earn reliable, fair and sustainable incomes, they are empowered to provide for their families and experience renewed hope for the future. Many of these entrepreneurs hire people in their communities who may otherwise be overlooked for jobs, including women, people living with disabilities and survivors of trafficking. Noonday ensures they pay fair wages, provide safe and healthy working conditions and prohibit child and forced labor. Right now Noonday works with 29 artisan businesses in 12 countries around the world. You can read more about each of them and their personal stories here. "I've always been aware of social needs throughout our country and the world and it is a huge passion of mine. It is the main reason I decided to join Noonday. Since becoming an ambassador my eyes have been opened to how business can change communities. I never used to like giving power to money because it can be turned into greed. However, our purchasing power in the U.S. is unlike most throughout the world and THAT is powerful. If we all are more conscious about where we buy things that we already purchase, then we will create a flourishing world. So the next time you are shopping, go to a local boutique or farmers market and seek out the ethical and fair trade stores online. When we do this, we have the chance to be better together." April was kind enough to share her pieces with me, and I am so excited to share some of my favorites from the collection with you! PLUS, since June is an extra special month, a portion of all Noonday Collection sales support the giveback impact and social needs in Hati. Noonday is hoping to raise enough funds to build a mother and daughter a home. I can’t think of a better reason to elevate your summer look! These cobalt beauties are made of leather and seed beads. Tassel earrings have been huge this season, and this pair is especially lightweight - making them easy to wear all day long! I adore the colors in this piece! If you follow me, you know I am drawn to anything pink and blue! Made with glass beads and featuring a soft cotton tassel, the boho-femme vibes are strong in this dainty everyday bracelet. This glass bead and leather cuff compliments any outfit with its rainbow of hues. It’s a great summer statement piece and comfortable to wear – a must when it comes to jewelry in my book. I fell in love with this weekend-ready/carry-all bag the moment I saw it! The intricate embroidery and butter-soft leather is exquisite to touch. Made with hand woven wool, this bag is crafted by women in the rural regions surrounding Ayacucho, Peru. They work from their homes, allowing them to earn an income while caring for their children. They use traditional embroidery techniques and motifs that preserve their cultural heritage. This earthy wallet is made entirely by hand by artisans in India. The stunning color palette and hand woven leather make for a truly special accessory to hold all your essentials. One of Noonday’s most loved styles, and one of my favorites from their collection! These are SO lightweight and look amazing with everything. Bold, easy and boho, these earrings are made with love in Hati, using upcycled metals like oil drums, allowing artisans to transform unwanted materials into something truly beautiful. The artisan business in Haiti empowers Haitians to pull themselves out of poverty through dignified work. Haiti is a country that has faced numerous challenges, from government instability to natural disasters. The artisan partners there are masters at creating beauty from the rubble and use their materials to their fullest potential. I love stacking bracelets, and these three just felt right together! The silver wrap and cuff are so great because you can adjust them to fit your wrist. The vibrant glass bead bracelet has a magnetic clasp, making it extra sturdy to wear. 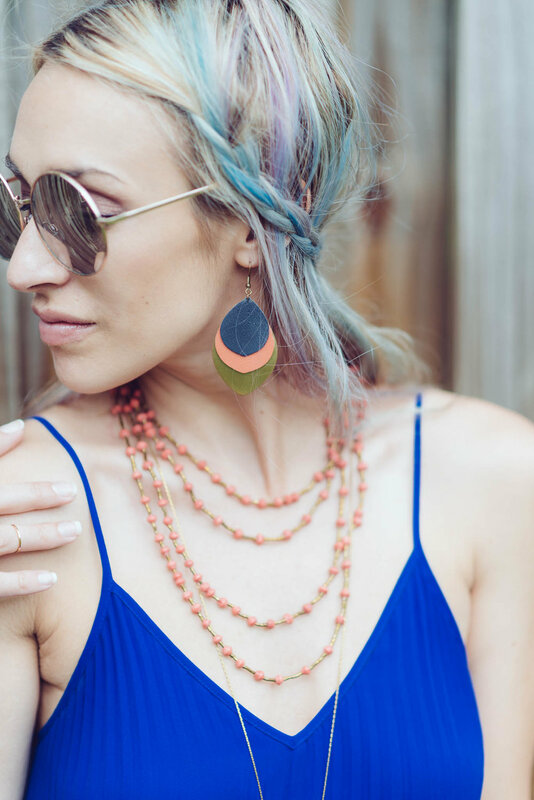 These navy and coral earrings are made in a vulnerable community in India, with leather and mixed metals. I seriously love how you can dress them up or down! And that they are empowering both men and women to provide for their families. Two more favorites here! Send a message with this gorgeous brass bracelet handcrafted by artisans from the slums of Kenya. Classic gold makes this piece endlessly wearable while the special hand-etched design makes it stand out from the crowd. Dazzling amazonite and gorgeous abalone shell adorn a sweet brass open cuff for a style that will elevate any ensemble, made with love in Peru! This simple paper bead necklace can be worn so many ways! And is an easy add-on to any outfit. Jalia and Daniel are social entrepreneurs in Uganda who share Noonday's dream of using fashion to create opportunity. They launched their business in 2010 and have created dignified work for hundreds of Artisans in their community. The Artisans gather every day to eat, laugh, and create together. This bracelet set is the perfect accessory for a casual look or something more glam. Perfect for an everyday arm party as well! The aqua paper bracelet is made in Uganda and comes in aqua salmon or teal. This ivory resin necklace is so chic – I love the gold strip down the middle - wear layered or on its own. The gold shimmer of fringe on this pendant is perfect for adding some length to your look. I absolutely adore all of the collection. I wish I could let all of you see, touch, and try them on in person, but believe me, you can feel the love, care and craftsmanship built into each piece. ***All Noonday Collection purchases this month support the giveback impact in Hati and you get something pretty! How does that sound!? Winner will be announced on my blog next Saturday, 6/10. Good luck!